Syria files complaint with UN following Israel’s airstrikes targeting weapons meant for Hezbollah. Syria on Friday sent two letters to the UN in which it said that Israel’s airstrikes on the country violated international law, the UN Charter, and “the sovereignty and the sanctity of Syrian territory,” the Syrian news agency SANA reported. In letters sent to the UN Secretary General and the President of the Security Council, the Syrian Foreign Ministry said that “in flagrant defiance of the international legitimacy and UN resolutions and the sovereignty and the inviolability of the Syrian territory,” four Israeli warplanes violated Syrian airspace and targeted a military site in the eastern countryside of Homs province. “As part of its right to defend the sanctity of its territory, the Syrian air defense responded to this aggression and shot down one of the planes while the rest of them were forced to flee,” the Ministry wrote, according to SANA. “Syria calls on the UN Secretary General and the President of the UNSC to condemn this blatant Israeli aggression, to force Israel to stop supporting terrorism in Syria, to implement all UNSC resolutions on counter-terrorism, including resolution No. 2253, to withdraw from the whole occupied Syrian Golan to the line of June 4th, 1967, and to implement resolution No. 497 for 1981,” it wrote. Syria launched several anti-aircraft missiles towards the Israeli aircraft that carried out Thursday night’s airstrike. While Syria claimed that it shot down one of the Israeli aircraft, the IDF denied that any planes had been struck and stressed that Israeli troops and citizens had not been in danger at any point during the incident. Prime Minister Binyamin Netanyahu said on Friday that Israel would continue to act to prevent the transfer of weapons to Hezbollah. 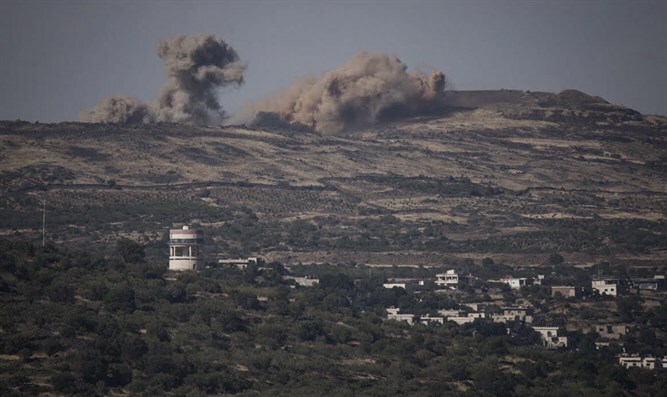 The Syrian Foreign Ministry’s complaint to the UN was filed after the Syrian army reacted angrily to the Israeli airstrike on Friday and threatened to respond harshly.